Home fusion power It’s the 21st Century. Where’s My Fusion Reactor? Nuclear fusion is 30 years away, and always will be. That’s the refrain we’ve heard, again and again for decades. And yet, quietly, fusion has advanced exponentially since 1970, about as quickly as Moore’s Law. We’ve progressed, in fusion, from clunky TRS-80s and Commodore 64s, to today’s iPhones and Macbooks. But this is a story that few have noticed. Unlike computers, fusion has to get really great before it’s useful at all. Right now it’s pretty good, but not quite good enough. It’s getting close though. There’s another reason the story’s been missed. We’ve spent billions on enormous, horribly complex fusion reactors that aren’t expected to be commercially available before 2050…and even then, it’s hard to see how they wouldn’t be too expensive. And not a moment too soon, with CO2 levels already at 400ppm, and no significant emission cuts in sight. The clock’s running out. We need something dramatic. If we may be permitted a football analogy: We’re five points behind, there’s half a minute left in the game, we’re a long way from the endzone, and we’re not going to get there in time by playing it safe. We need a long pass. We might not win, but it’s the one play that gives us a chance. Or in gambling terms…it’s worth drawing to an inside straight when there’s enough money in the pot. March 29, 2019 - Last-minute deal grants European money to U.K.-based fusion reactor Science MagazineJoint European Torus fusion reactor in the United Kingdom gets €100 million to continue to operate as a European facility. March 25, 2019 - Bertin to design optical analyzer for world's largest fusion reactor Optics.orgITER Organization signs contract with French technology firm for density interferometer polarimeter system design. 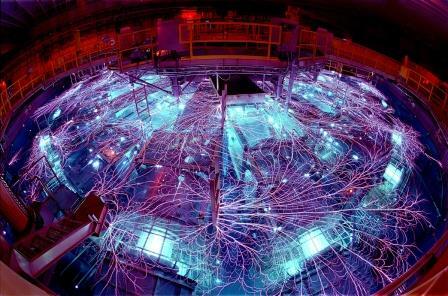 Are you aware that in Vancouver you have one of the tree companies building LENR (Alias cold fusion) reactor. Even you you are not absolutely convinced, given what is happening you should look further to rulout a huge blackswan. I bet nobody will dare to look into the telescope.